Ask about the COOKING and WINE TASTING PACKAGES FOR 2019/20. Barn & cottage together for large groups : 7 bedrooms, 4 1/2 bathrooms. Ask for our prices for different groups. 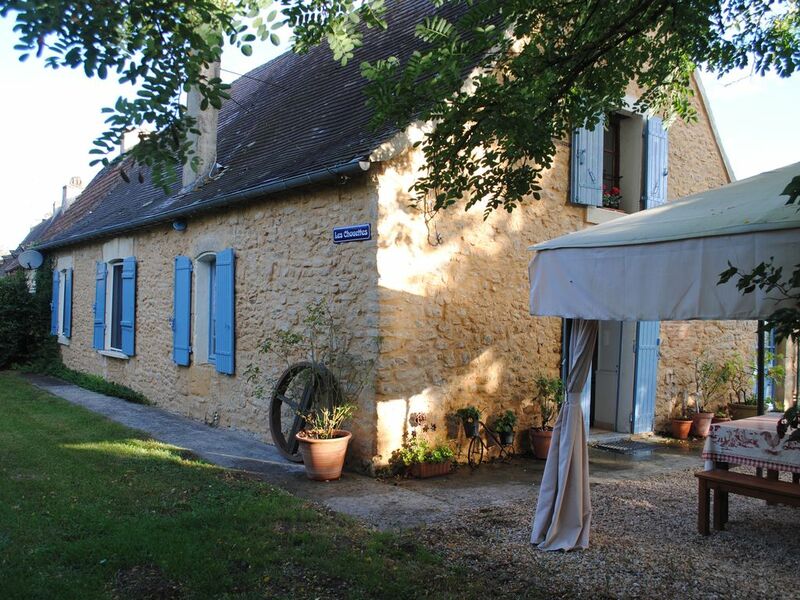 The French Country Cottage - Les Chouettes is a typical Perigoridian Cottage. It is a restored farmhouse. It offers a tranquil environment, charming French decor, a great private pool for those warm sunny days which overlooks a walnut orchard.This converted farmhouse has 4 nice size bedrooms and is able to comfortably accommodate up to 8 people'. The main bedroom is beautifully decorated in typical french style and very spacious. The kitchen is well-equipped for you to try your hand at any new recipes with the ingredients from any of the nearby markets. There is a good size stove and oven, fridge/freezer, and microwave. (We have a spare fridge/freezer in the laundry to keep your drinks cold in the summer) The dishwasher will take care of any dirty dishes. Les Chouettes within easy driving distance from Bordeaux, Sarlat-la-Caneda, Bergerac, Lalinde, Le Bugue and Perigueux, only1 km from Tremolat village in the Dordogne valley of Aquitaine. The Old Barn is recently restored. It is light and airy with its own entrance. It has 3 bedrooms. It offers a tranquil environment, charming French decor, and its own private plunge pool for those warm sunny days which overlooks a walnut orchard. It has its own kitchen equipped with all you need to cook a lovely meal. PLEASE NOTE: If you are renting only the cottage or only the barn you will not have the use of the other unit. The village of Tremolat is only a 20 minute walk has its own Boulangerie, a Pizzeria, a Michelin star Bistro, a Wine Bar and a fabulous Michelin Star restaurant. Leaving Tremolat village (on the other side) a mere 4 km is a typical Perigordian Auberge called Les Truffiers. Here you will be welcomed by Yannick. You will enjoy the most incredible meal (try to go with an empty stomach) He really provides the most wonderful gastronomic experience.. The restaurant is quirky and fabulous. This is a wonderful, charming and very special property, full of character, and beautifully furnished. So whether you are celebrating a special occasion with your loved one or planning a holiday with your friends and/or family needing some quality time together, there is something for everyone to enjoy at Les Chouettes and our beautiful valley of the Dordogne, which is rich in history and offers so much for one to do. Please feel free to call or e-mail us if you have any additional questions or need any additional information. The owners are Alan and Karen Carter, we are South African,. We have travelled and lived in America and the UK and included all the things we like to have when we are away from home. We discovered the Dordogne in 2008 when we visited a friend who owns a property outside Tremolat. We both have fallen in love with the area. Alan and I would like to share our beautiful farmhouse and now recently our newly RENOVATED barn with anyone who loves fabulous food, unbelievable scenery, amazing history, and peace. The peace you too discover. FREE WIFI - Winter Specials - :: GREAT for CHILDREN We are equipped with table tennis, Volley Ball and Bicycles. The property is in easy access of the main freeways. No matter what your interests are, everything is close by - vineyards, castles and history, history of early man, nature, water sports, walking, cycling, markets, shopping and fabulous restaurants. Around every corner is a new experience!! Tremolat Village hosts the most beautiful 11th Century Church, A Michelin Star restaurant at the Hotel Les Vieux Logis, a Bistro en face, Pizzeria, an Auberge and a wine bar. This is to be used for emergency purposes only. We have left the basics in the pantry such as sugar, salt and some herbs and spices. Please note that it is your responsibility to provide your own. There is a table which seats 8 to 10 in the cottage as well as 3 outdoor living areas. There is plenty of dining space for 6 people in the barn and 1 outdoor living area. The pool is enclosed by a fence. The barn has a plunge pool. The French cottages, Les Chouettes in Tremolat is wonderful. We rented both the barn and cottage for 10 days with our extended family. Both houses are very well equipped with everything that one could need. The beds and furniture are very comfortable. Their towels are large and luxurious. There is so much to see in the Dordogne Valley from medieval cities, chateaus, and outdoor markets. We really liked the market at Issigeac. The Bistro in Tremolat is highly recommended too. We had a fabulous time at Les Chouettes! This cosy, comfortable and well equipped home was absolutely perfect for our time spent in the south of France. The kitchen was perfectly equipped - meal making was an absolute pleasure. The lounge was warm and incredibly cosy, with a lovely fireplace and games for cold winter's days. Very convenient washing machine and tumble dryer, and a great supply of wood for the winter. Our bed was very comfortable with fresh, crisp linen, and the house is situated in the perfect little neighbourhood. It neighbours a number of small villages, which makes exploring the Dordogne valley incredibly easy and pleasurable. Karen was incredibly helpful, hospitable and kind, and we'd highly recommend staying at this property in Tremolat! Thank you for being the perfect guests. We hope that you were able to visit all the "spots" that you had on your bucket list. We have rented often in the Dordogne region and were pleasantly surprised to find a gîte that was not only very well-equipped but also beautifully furnished. We found it very comfortable for our party of 6 (including teenage children and aged parents). Being Australians visiting in December, we also appreciated the heating. A wonderful stay, thank you! Thank you for writing about our cosy cottage. Thank you for choosing us for your holiday. I am glad you found the cottage warm i hope you were able to make good use of the fire place too. Charming, characterful and restful residence. Our party of 4 loved the intimacy of the cottage, and the conveniences it offered. A well situated property on the outskirts of Tremolat that allowed one to enjoy the solitude and peace of the surroundings, yet with full access to all major attractions in the area. An ideal getaway for busy people that need some down time, and an opportunity to rest and relax. The is well furnished and was able to provide for all our needs to ensure a home from home experience. Our charming hostess and property owner organized 2 fantastic events with local individuals who shared with us their knowledge and skill in the art of food making and wine tasting. Thanks Karen for assisting us to make my husband's 60th birthday as memorable as it was. I am hoping that in the future we will be able to return to your beautiful part of the world and enjoy the comforts of your properties. Thank you for being such wonderful guests and for treating our cottage as your own. We are thrilled that Niel had a fabulous birthday celebration. Thank you for including me in your wonderful evening at the michelin restaurant Le Vieux Logis - what a surprise. We hope that you all have returned home safely. Tremolat is a great location to explore the Dordogne Valley--Karen was a marvelous resource and the property is charming. We felt that we could enjoy the country life and feel part of the community. Excellent experience. We will be back! Thank you for taking the time to review our cottage. We are glad that you all had a wonderful time. With the weather hitting 40 deg the good sized pool was well used , the facilities where excellent . The family even took a canoe ride down the dordogne from Limeuil ( 20 mins drive ) , what lovely scenery . Step into ancient history by visiting the worlds best kept secret - The Dordogne valley of the Aquitaine Region. The French Country -Cottage Les Chouettes is situated in the hamlet of Nardoux, 1 km from Tremolat village. The property backs onto a walnut orchard. It is accessible to great walks, and cycle trips in the countryside. One can enjoy lovely day trips by foot, bike or car. .
Visit Sarlat for its wonderful market on a Wednesday and Saturday or simply enjoy the ambiance of this beautiful town. Beynac Castle and its lovely village is worth a visit as well as a trip up the Dordogne River in a Gabarre(an old trade boat) What a great way to get an insight to the castles and chateaux of the area. A visit to Les Eyzies is a must as well as a visit to the Lascaux Caves. These caves contain some of the oldest and finest prehistoric art in the world. The cave paintings, which mainly depict animals, are some 17,000 years old and seem to have a ritual purpose. For preservation reasons, the public may only visit a well-executed replica called Lascaux 2.